Steve Jackson Games published 50 issues of Space Gamer, the magazine of adventure gaming. Those back issues (listed below) are available in PDF format on Warehouse 23. 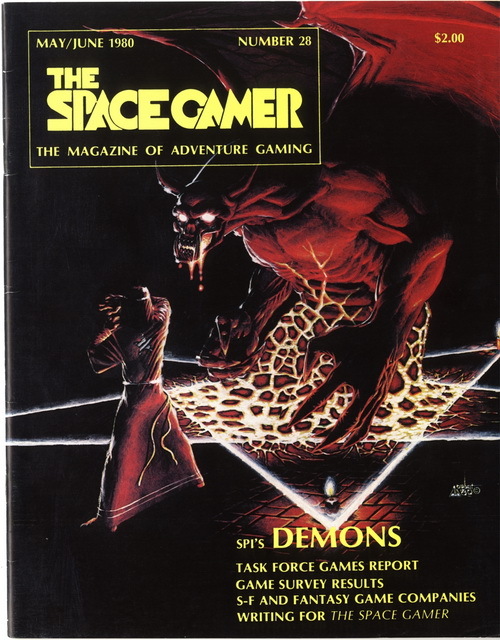 Don't let the issue number fool you; this is the historic first issue of Space Gamer to be published by Steve Jackson Games. 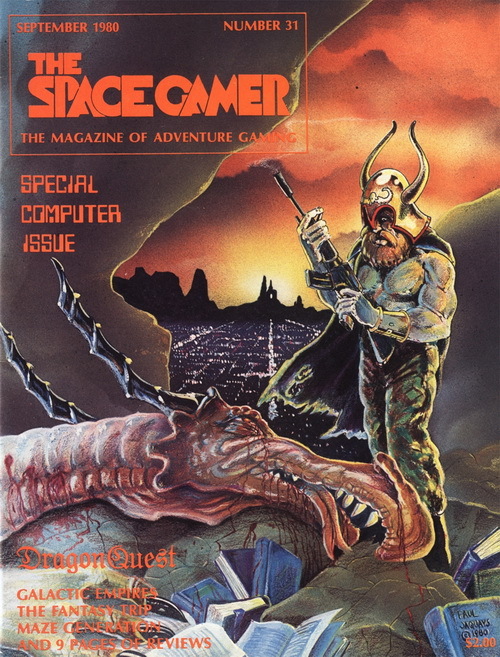 This inaugural issue, Space Gamer #27 (cover date March-April 1980), is a fascinating snapshot into the gaming hobby's past. The articles are still fun to read, too! 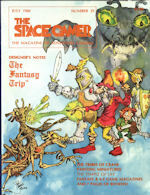 In addition to the game reviews, news, and letters in every issue, this installment contains a designer's introduction to the game Hot Spot, a look at how to incorporate time travel into games, advanced nuclear rules for Invasion of the Air Eaters, muskets and hobbit weapons for use in Melee or The Fantasy Trip, a look at computer algorithms for wargame programming, and the first in a series titled "Game Design: Theory and Practice," co-written by none other than Steve Jackson. 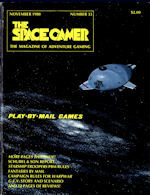 Space Gamer #28 (cover date May-June 1980) presents another fascinating snapshot into the gaming hobby's yesteryear – and the articles are fun to read, too! 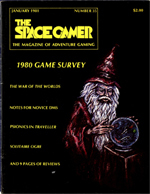 Space Gamer #29 (cover date July 1980) presents another fascinating snapshot into the gaming hobby's yesteryear – and the articles are fun to read, too! In addition to the game reviews, news, and letters found in every issue, this installment contains Steve Jackson's designer's notes and errata for The Fantasy Trip; the first in a series on painting fantasy miniatures; the last article giving information about how to computerize hex-maps for wargames; a fantasy short story entitled "The Temple of Life" (with stats for The Fantasy Trip and Advanced Dungeons & Dragons); and the third in the series "Game Design: Theory and Practice" (co-written by Steve Jackson). Of interest to armchair archaeologists, this issue also contains an overview of all magazines related to fantasy and sci-fi gaming (as they existed in 1980), complete with Steve Jackson's thoughts on each publication. 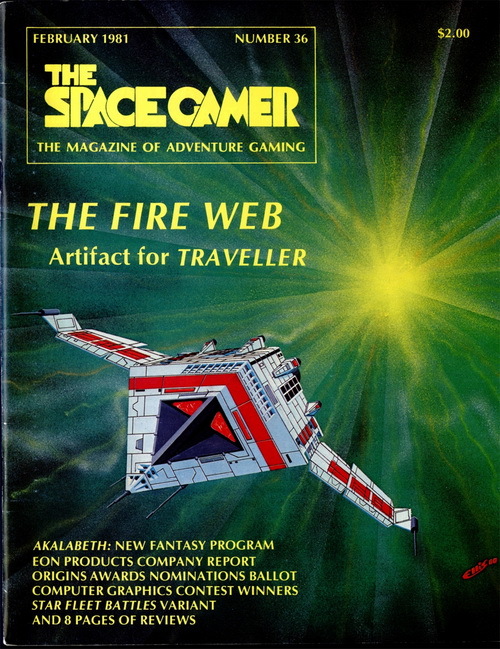 Space Gamer #30 (cover date August 1980) provides another trip into the gaming hobby's yesteryear – and the articles are entertaining, too! 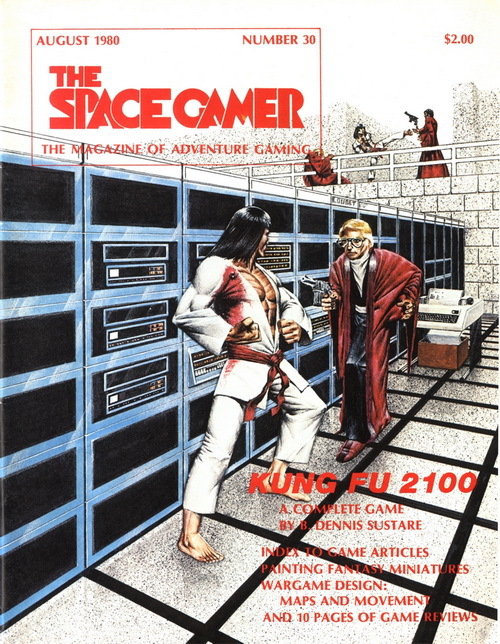 In addition to the game reviews, news, and letters found in every issue, this installment's big surprise is the inclusion of Kung-Fu 2100 – a complete tactical two-player game you can print out and play. Enjoy a healthy helping of futuristic furious-fist action! It also includes the first part of a feature about using programmable calculators in wargaming; the second in a series on painting fantasy miniatures; and the fourth in the series "Game Design: Theory and Practice," co-written by Steve Jackson. Finally, for long-time fans, it provides an index of what was in issues #15-29 of Space Gamer. 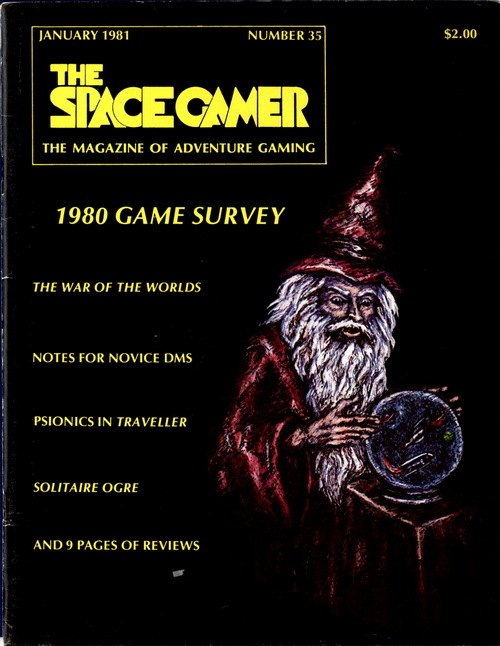 Space Gamer #31 (cover date September 1980) takes us once again into the gaming hobby's early days – and the articles are fun to read, too! In addition to the regular game reviews, news, and letters, this is the "Special Computer Issue." (Remember that this is computer gaming 1980s-style – the ad on page 3 proclaiming "We do Games, not Windows" is being prophetic, not ironic!) The showcase article is the "1980 Game Software Survey," which includes information on 17 companies that were creating hobby- and game-related software at the dawn of the home-computing era. Also included is "Deus Ex Machina," an article that gives a computational technique for generating random dungeons; "Sam Beowulf," a piece of fiction that recasts the epic hero as a hard-boiled private eye (complete with stats for The Fantasy Trip, Dungeons & Dragons, Tunnels and Trolls, and War of the Ring); and the fifth in the series "Game Design: Theory and Practice," co-written by Steve Jackson. 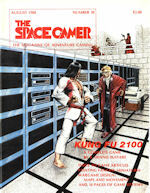 It also contains errata for Kung-Fu 2100 (from Space Gamer #30). 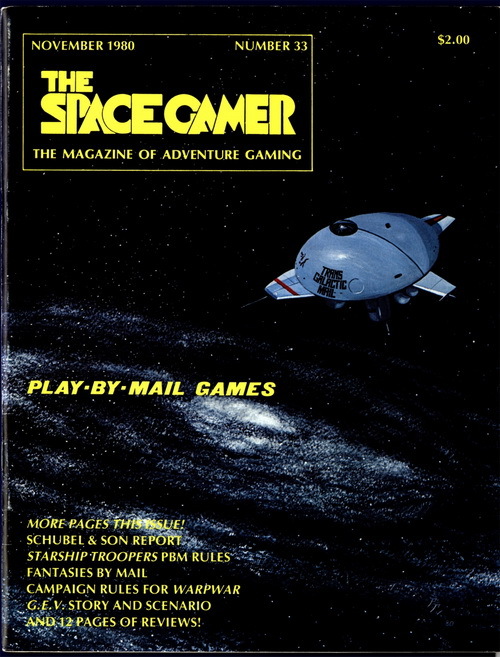 Space Gamer #32 (cover date October 1980) fires up the transdimensional jump drive and transports you, the reader, to the gaming hobby's early days – and the articles are fun to read, too! 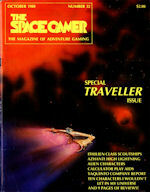 In addition to the regular game reviews, news, and letters, this issue's focus is Traveller. Supporting this theme is the article "Alternate Characters for Traveller" (providing rules and guidelines for generating alien or non-human heroes), a deck plan for the Ithilien-class scoutship, and reviews of nine supplemental Traveller products. Also included is "Deus Ex Machina," presenting three different bits of wargame-aiding code for a programmable calculator; "Minus Two Reaction," a short piece of fiction that begins (and ends) in a bar; "Ten Characters I Wouldn't Let in My Universe," a lighthearted list of NPCs to (not) add to your fantasy RPG; and the sixth in the series "Game Design: Theory and Practice," co-written by Steve Jackson. For historians, this issue contains a company report on Yaquinto Publications by one of its key members, Steve Peek. More important, it also has information and insight into October 1980's big news: the formation of a little company called Steve Jackson Games. 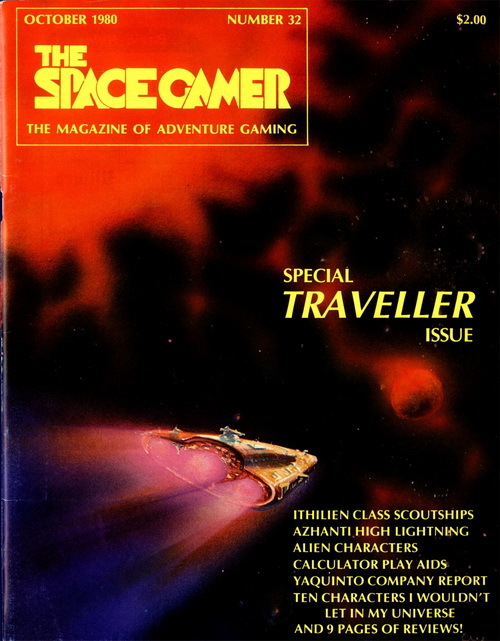 Space Gamer #33 (cover date November 1980) gives you a first-class ticket on a spaceship to the gaming hobby's early days – and the articles are fun to read, too! In addition to the regular game reviews, news, and letters, this issue's featured theme is "Play-by-Mail Games." Articles on this topic include "WarpWar: The Campaign Game," with information on how to turn that wargame into an ongoing series (adaptable for mail-based play); "Fantasies by Mail," providing insight into how to play fantasy RPGs by mail (or, nowadays, email); "PBM Rules for Starship Troopers," providing long-distance rules for that classic wargame; reviews of four space-themed play-by-mail games; a cataloging of then-current mail-based game companies; and a company report from Schubel & Son, a play-by-mail company. Beyond the theme, there is a three-player G.E.V. scenario (complete with new units! 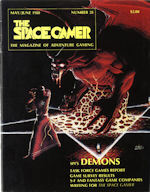 ); an article about how to incorporate 3-D plotting and displays into a computer program; the results from Space Gamer's Trap Contest; "End Game," a piece of fiction set in the Ogre universe; and the seventh in the series "Game Design: Theory and Practice," co-written by Steve Jackson. 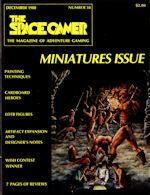 Space Gamer #34 (cover date December 1980) is devoted to "Miniatures" . . . which is to say, it leads the way – and the articles are fun to read, too! 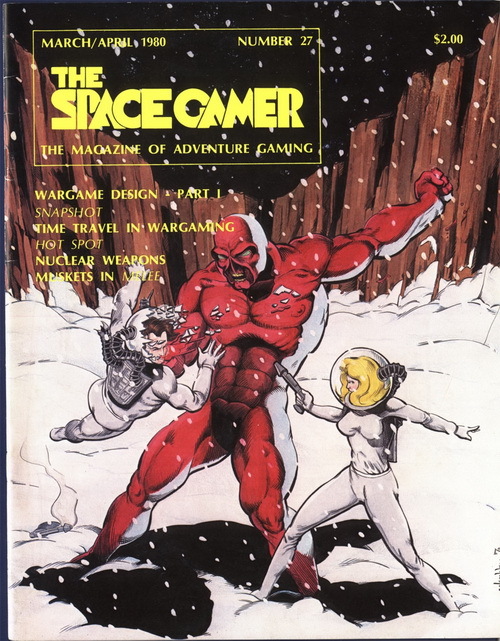 Space Gamer #35 (cover date January 1981) welcomes you aboard for another trip into the gaming hobby's past – and the articles are fun to read, too! 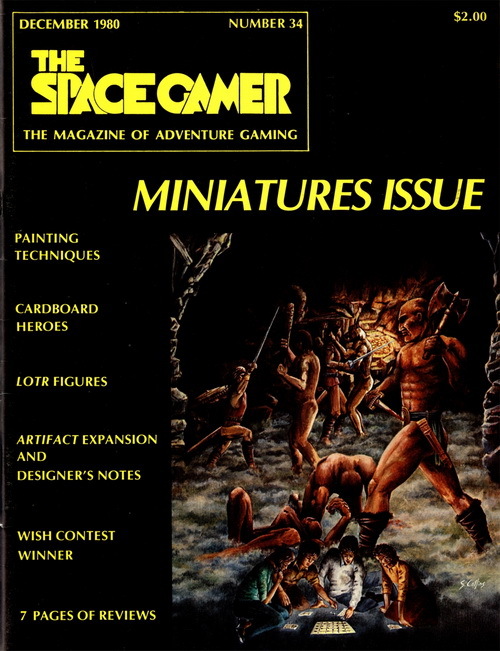 In addition to the regular game reviews, news, and letters, this issue includes "Solitaire Ogre," detailing a solo scenario for that classic game; "Notes for Novice Dungeon Masters," with some brief tips for how to prepare and what to read; the winning contest entries for "Characters I Wouldn't Want to Let in My Universe"; variations on the wargame Stomp; broad insight on how to set up a computer for play-by-mail gaming; "More Psionics for Traveller," detailing additional rules for the granddaddy of all sci-fi RPGs; and the ninth in the series "Game Design: Theory and Practice," co-written by Steve Jackson. Space Gamer #36 (cover date February 1981) "fires up the retrorockets" in the way it does best – and the articles are fun to read, too! 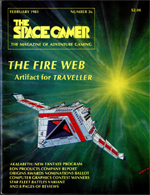 In addition to the regular game reviews, news, and letters, this issue includes the short story "Pawn of the Fire Web," complete with stats for Traveller; an alternate damage system for Star Fleet Battles; a company report for Eon Products, original publishers of the classic game Cosmic Encounters; "Playing Paragon," insight for how to play someone who's as morally good as he can be (written by gaming legend Aaron Allston); the five sins of computer-game writing; and Part 10 in the series "Game Design: Theory and Practice," co-written by Steve Jackson. Of special interest to computer-gaming historians: Steve Jackson also has a featured review of Akalabeth, Lord British's spiritual predecessor to the Ultima series of computer games.